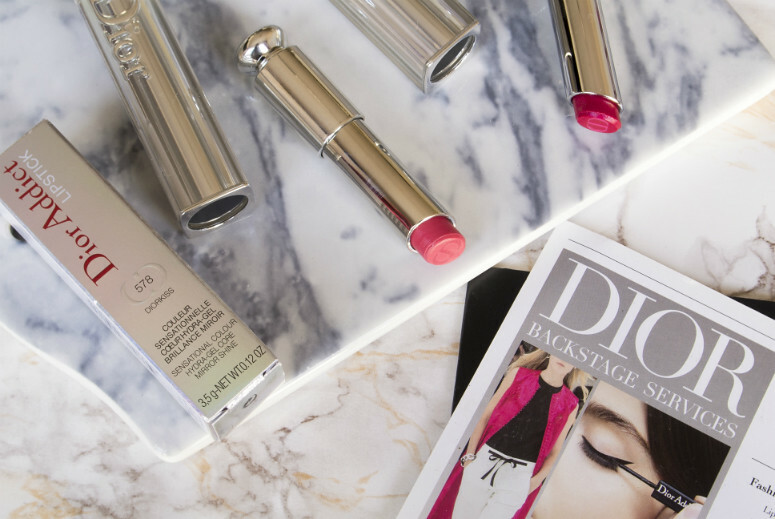 Dior have recently relaunched their Dior Addict lipsticks, with brand new packaging and a new formula. Just look at how everything shines! The box, the packaging, the lipsticks, everything literally gleams. Described on their website as a lipstick with a 'hydra-gel core with a mirror shine', I really wouldn't disagree with the description. Made with three oils (I have yet to work out what oils have actually been used), this is a very moisturising formula, so have no fear of your lips drying out with this formula, or of it tugging at your lips. Dior have labelled their oils as the 'sensorial', 'comfort' and the 'shield' oil, all rather fancy names for their different functions. From what I understand, the Sensorial one helps keep the formula smooth and easy to use, the Comfort one is, quite naturally, for keeping your lips moisturised, and the Shield oil is to help keep the colour on your lips for longer. I'd call the new lipsticks a crossover between a thick lipbalm and a lipstick. I suppose you could say that it is a lip tint, but it goes much further than that in the colour department. They're more like a really thick version of the MAC Huggable lipsticks, but go on much more smoothly, sit far more comfortably on the lips, and pack a load more colour. I have the shades 578 Diorkiss and 976 Be Dior; Be Dior is the shade you see Jennifer Lawrence wearing in the ads, which is a bright raspberry colour with a fuschia shimmer, while Diorkiss is a warm rosy pink. It is possible to get a really precise line with these lipsticks, using a lipbrush, but I like these for a more casual look, smoothing it on the lips straight out of the tube. For more colour, and to get the really shiny effect, you'll need to go into the lips a few times, as a one-coat slick won't cut it. It seems a bit more effort, but to be honest, they are so easy to apply, and I find these a great option for adding colour to my lips with minimal effort, and keeping my lips hydrated at the same time. My lips have been having a bit of a tough time lately from illness and stress, and I've been opting for these when I need to keep myself from looking like death warmed up but still want a little tender care on my lips. If there's anything I'd advise about these, you don't really need lipbalm before applying. If you do, the colour might end up sliding a bit too much over the place, and frankly, that's not a good look for anyone! These do verge onto lipgloss territory, but I think they're much more longlasting and a tad less sticky than most lipglosses I've come across. Verdict: if you're looking for something comfortable to wear on the lips during the colder months, but still want something that has colour, I highly recommend these. The new Dior Addict Lipsticks retail at £26.50. I got mine from Boots because they had a 'buy 3 products and get 1000 points' offer on. Absolutely love shade 578! I guess it's time to open Christmas gift wish. I keep seeing these and I'm SO tempted!